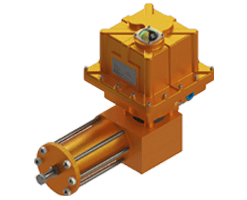 Spring Return Electric Actuators | Indelac Controls, Inc.
Fail-safe spring return electric actuators – more simply known as spring return electric actuators – are used on linear and rotary valves in a range of applications across nearly all industrial process systems. These types of actuators are used in situations that require valves to automatically and immediately enter a safe position upon loss of power. Upon restoration of power, the actuator immediately returns the valve to its normal operating position, and is ready to resume normal operation. When energized, the valve actuators move the valve to its operating position while opposing the motion of a spring mechanism. This action compresses the spring, causing a buildup of potential energy. When the system is de-energized – such as in a power failure event – the potential energy from the spring is released, and the valve is snapped into its fail position. The actuators fail position can be either the fully open position or the fully closed position only. Fail-open: The valve’s operating position is closed. Upon loss of power the actuator springs the valve to the fully open position. Fail-closed: The valve’s operating position is anywhere in the open range. Upon loss of power the actuator springs the valve to the fully closed position. 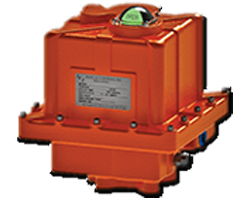 Spring return electric actuators from Indelac Controls Inc. (ICI) are specially designed for fail-safe applications using quarter-turn valves and dampers. 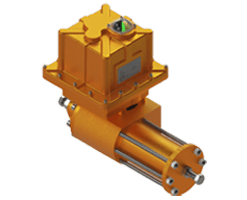 Our spring return electric actuators are equipped with a hardened steel spur and helical gear drive train to guarantee reliable protection against catastrophic process failure during loss of the electricity to the system. Internal components are permanently lubricated at our manufacturing facilities, ensuring high efficiencies between moving parts, minimal routine maintenance, and quiet operation throughout the life of the actuator. All standard equipment is enclosed in a heavy-duty aluminum enclosure with a thermally bonded ultraviolet resistant polyester powder coating to comply with NEMA 4 requirements for protection against ingress of water, dust, and dirt. Optional enclosures are available to meet or exceed the NEMA 4X and NEMA 7 specifications for safe and efficient operation in corrosive, ignitable, or explosive environments. Epoxy coatings are available to protect against caustic wash-downs, additional coating options are available upon request. To ensure compatibility with a wide range of applications, ICI’s spring return actuators are available in six different models with various specifications and end torque capabilities (up to a maximum of 1,200 inch pounds). 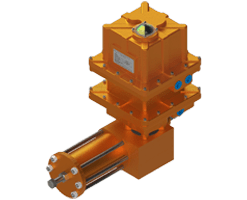 Unlike pneumatic spring return actuators, spring return electric actuators must be powered to the open position and powered to the closed position during normal operation to maximize the life of the product. The spring return fail safe functionality is for use during power failure only. Our actuator units have been designed to provide accurate control and reliable fail-safe automation capabilities while also striking a balance between cost-effectiveness and durability. At ICI we focus on offering a wide array of spring return actuators for any application. See our best-selling models below to find out which one best fits your application. If you would like to learn more about our spring return actuators or if you need advice from our technical team, contact us or request a quote.